056 : Content ! its relevance & consistency – keys for brand engagement on social media! At Social Media Week Bangalore, Mahesh Narayanan and Ganga Ganapathi shared their valuable knowledge and views on sharing appropriate, targeted content on correct channels. 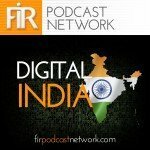 Welcome to the 54th episode of Digital India Podcast on FIR Podcast Network. This show is ‘Weekly Updates’ brought to you by staff and students of Web Marketing Academy.